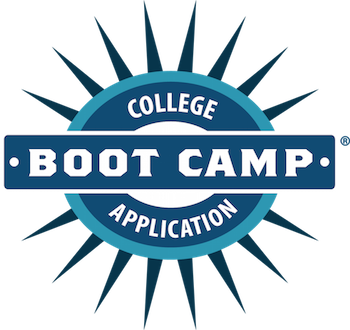 You found the original Application Boot Camp®; helping students prepare the best possible applications for the last 14 years. Work with Dr. Michele Hernandez, Mimi Doe, Dr. Kristen Willmott, Maria Laskaris, Eliza Fox and the Application Boot Camp team to prepare a suite of essays and to develop an application strategy to increase your college acceptance odds. Seats are limited so sign up today and receive your Personalized Admissions Report. Reserve Your Spot NOW!Reserve Your Spot NOW! What happens during Application Boot Camp? During the four days of Application Boot Camp students will work one-on-one and in small groups to review and finalize their text entries for the Common Application; prepare multiple essays including all required essays and extra essays using the Application Boot Camp strategy; develop an application strategy to increase college acceptance possibilities; receive advice on their odds at targeted colleges; complete an edited condensed activity sheet to submit with the Common Application; and take part in interview training. Also, the Application Boot Camp program includes access to our members-only ABC Membership Site, the ABC personalized student report, follow-up phone call, and four days of in-person admissions consulting at Boot Camp. Within the included guides on the Welcome Kit tab on the ABC Membership Site and in the report, we provide very thorough answers and instructions for guidance throughout the program. This is not an unlimited-time program, so we are not able to answer multiple additional questions beyond the personalized student report and follow-up phone call. When is Application Boot Camp? Boot Camp is 9am to 5pm for 4 days in a row in August. Note: We have a 9:30-10am coffee meet-and-greet on day 1 for parents and students and a closing parent meeting on day 4 from 3:30-4pm. If you are coming in from out of town, we recommend you arrive the night before day 1 and leave the evening of day 4 (the last day) or the morning after. Who is Application Boot Camp for? Students who will be rising high school seniors in August 2019 (for ABC 2019 students) OR students who will be rising seniors in August 2020 (for ABC 2020 students), including U.S. and international students. College students seeking to transfer. Non-traditional applicants (home-school or community college students). Re-applicants: applicants who were previously rejected and intend to reapply. Students interested in working in small groups and one-on-one consultations with our ABC staff including senior counselors. What is the report that comes with Application Boot Camp? The report is a chance to receive input from Mimi and Michele on what you can do NOW to improve your admissions results. It’s full to the brim with specific advice on a personalized testing schedule, summer options, ways to sharpen your scholarly focus and gives insight into the schools you are interested in from an admissions prospective. They make the nontransparent admissions process clearer and give specific ways you can rise above the rest by taking action as well as ideas for an application strategy. What else is included in the Application Boot Camp Package? Follow-up phone call with Mimi or Michele: Once you receive your report you will schedule a conference call with Mimi or Michele to review the plan. Access to our ABC Student Membership Site. ALL of our content e-products including: The Ultimate Guide to Top High School Summer Programs, The Ultimate Guide to Top High School Contests and Awards, the Enrichment Guide, the Resource Guide, Virtual Workshops and our exclusive Mysteries of the Common Application PDF. What do I do between the phone call and Boot Camp? The time between the phone call and Boot Camp is when you put the suggestions put forth in the report into action. What is the student to senior counselor/staff ratio? Including Dr. Michele Hernandez, Mimi Doe, Dr. Kristen Willmott, & Maria Laskaris we have a student to Senior Counselor ratio of 3:1. What will students complete during the ABC session? You will leave Boot Camp with four or more essays that highlight your strengths, fit the criteria for the Common Application, and can be morphed into supplemental essays for schools that do not use the Common Application. You will have created a detailed Activity Sheet as well as other shorter writings to customize each college application. You will have a one on one meeting to finalize your application strategy and solidify a game plan that launches off the written report and you will understand how to put all application components together. I feel SO prepared. There is no way I could have received this guidance anywhere else. ABC enabled me to be strategic about my plan going forward. Thank you! Not the right solution? Try one of these Top Tier options! Have a scheduling conflict with ABC? Try our flexible Personal Boot Camp. Having a difficult time with your application?